Lead Acid 510A (EN) forever? Other standards are acceptable if evidence is provided that these standards are equivalent to one of the above stated standards. Since ever it’s evident that there is slight contradiction. All these norms (DIN, IEC…) were designed for automotive industry. Actually these standards quarantee MINIMUM cold cranking capability aka CCA (Cold Cranking Amps) for our cars. Seems to me we would like to use these standards to quarantee MAXIMUM cold cranking capability, but that’s not our case. The most important parameter of today’s F3B pair-winch-battery-is internal resistance of whole system i.e. 0.023Ohm minimum. 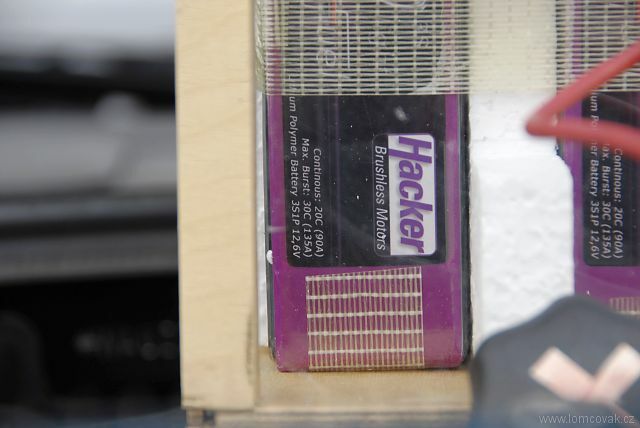 In F3B Arnhem I was watching strange wooden/plexiglas box with LiPo batteries on Jens Buchert’s car. Originally I thought that this pack is used for powering some big electro glider-mistake! This is normal starting F3B winch battery. Idea comes from Markus Wanner and I like it. 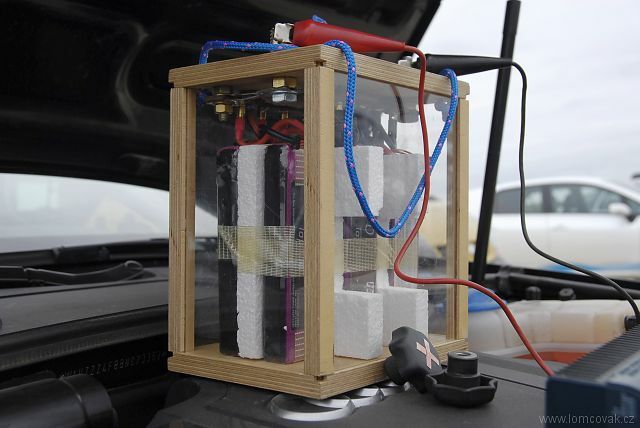 Guys are using this battery on training (using some extra resistance, LiPo’s have very low Ri) and on contest they use it as power container for recharging standard Lead Acid batteries. 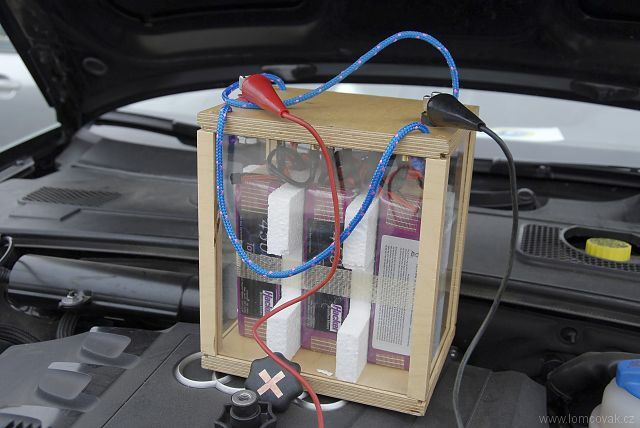 Note, that Jens was charging this LiPo pack from car battery, ecological thinking, well done! Just imagine you have F3B winch battery weighing about 2kg (!). Lithium technology is far efficient than Lead Acid and has many other advantages. Today there are even better LiXxx technologies like LiFePO4, LiFeYPO4. 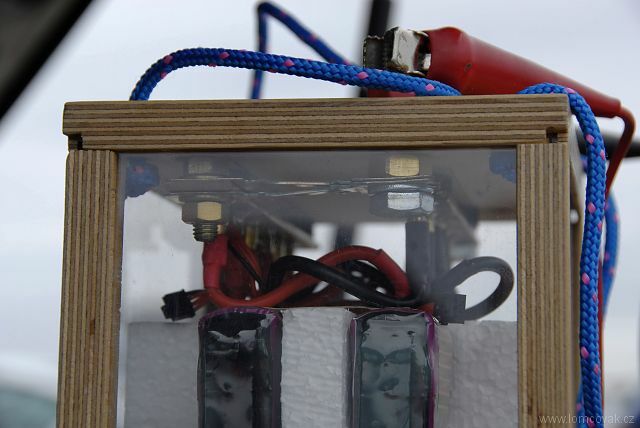 More secure and durable than classic LiPo. The only issue I see today is price, but it’s slowly changing. 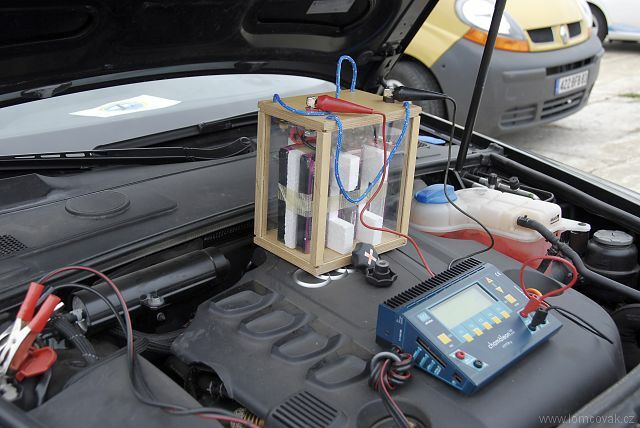 Shall we stay with Lead Acid winch battery forever? 5 comments to Lead Acid 510A (EN) forever? – Capacity : if there are no performance advantage in using a 570 EN (except number of launches), who minds? So If someone is able to propose a new rule than today (Batteries + system measurement), especially taking benefit of your “green” ideas, sure we will push in the same direction ! Yes, this situation lasts at least three years. Yes, I don’t even check (…and I was never checking) how mentioned norms/standards are changed in time and how this value on batteries is measured by producer. But as you can feel from my article above, this value (CCA) I treat today meaningless. There is one interesting parametr for us-internal resistance of battery Ri-and to be more precise, how Ri is changing in time i.e. during F3B launch which takes let’s say about 10sec in average. Some batteries will die very soon. Some keep power longer time. Anyhow both batteries must fullfill 0.23mOhm rule. I don’t think capacity is issue. 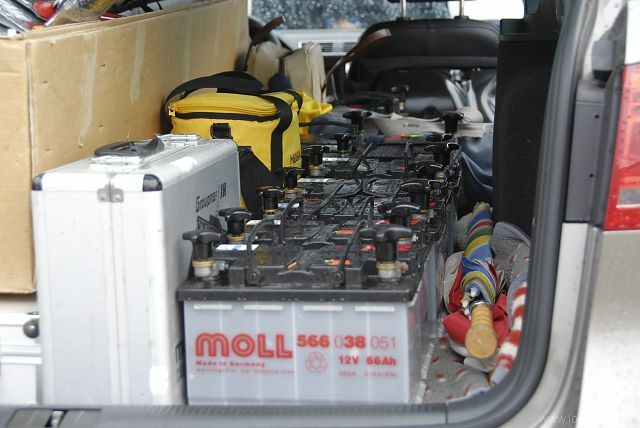 For me is better to carry 4 “light” batteries and change them sooner. Than to pull 90Ah/35kg dinosaurus. On contest, capacity is no issue at all, while everybody is charging battery after 3-4 launches. Some paranoia pilots even after every launch. I don’t think so there is any advantage of gel batteries not even during first 9-10 seconds. Maybe deep cycle resistance during longer lifespan, that’s all. As I wrote above, I wouldn’t switch back to “classic” wet lead acid battery from Optima, never. 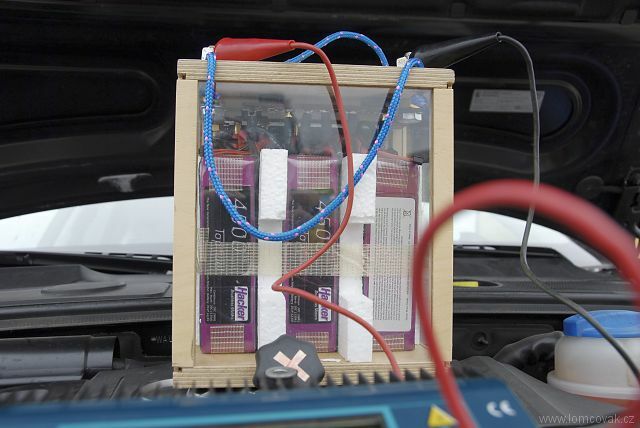 Future of our batteries is really not at Lead Acid. It’s cheap, that’s the only advantage today. As regards FAI rule change proposals we should talk to Ralf Decker. He is very experienced and maybe he can give us another point of view to the whole matter. If he will be in F3B Dresden I will talk to him. as promissed I was shortly talking at F3B Nardt to Ralf Decker. Under Ralf’s statement main reason for battery norm specification (EC, DIN, IEC…) is to help CD for first view to distinguish batteries looking not “so usuall” from “usuall” ones. If there will be no norms limit, position of organizer will a bit complicated, while he will be in doubt if it meets “usuall or expected” parameters. As I wrote above, the only important parameter of whole launching set today is internal resistance. Everybody who wants NOT to full fill 0.023 rule can use “standard” looking battery and CD will be more relaxed? I don’t think so. Necesarry to say that Ralf didn’t reject any change possibility. That’s status of whole matter today as I understand it. Do you still consider the optima yellow top to be the best choice? I am looking to moved away from Yuasa to sealed batteries. nothing changed in my opinion. The only drawback is that price of Optima is again higher (cca 180EUR incl. 21% VAT), at least here in CZE.